Over the past few years, I’ve been lucky enough to collaborate and work with all kinds of organizations focused on diverse and important goals: mental health, poverty reduction, employment, youth leadership, urban food growing, education reform and beyond. Most of these amazing organizations have a strong desire to involve the people they’re trying to benefit in a real and meaningful way, and yet many are struggling to achieve this. Genuine stakeholder involvement isn’t simple, and understaffed and overstretched organizations often don’t quite get around to doing it better. What’s more, our non-profit culture, from funding demands to our desire for efficiency, is geared away from this way of working. Most non-profit organizations have developed a language to describe the people they work with. Sometimes they’re called ‘service users’, sometimes ‘stakeholders’ and often ‘beneficiaries’. Less commonly I’ve heard them described as ‘members’. Almost never ‘owners’ or ‘partners’. I think the language that an organization uses is revealing. I’ve personally written dozens of funding applications where I’ve had to answer the question ‘who are your beneficiaries’? I understand why the word is used (charities work for the public benefit, and the word beneficiaries naturally follows) but I also think it’s deeply disempowering. ‘Beneficiaries’ implies people who are being helped, not people who are being given support to help themselves or, even better, people who are both guiding the organization and benefiting from it. Yes, deep participation takes time. It also creates a better project, one that best meets the needs of the people it claims to serve, has a genuine understanding of its stakeholders, avoids tokenism or exploitation, and sees potential pitfalls before they happen. 1. Design your project carefully. Start by talking to the people you want to benefit. Ask them what they think about your ideas, and listen carefully to their responses. If you’re trying to build a community garden, talk to community members about whether they like gardens, enjoy gardening, and would use a community garden. Find out what the barriers would be to them taking part (maybe it’s lack of know-how, or time, or gardening tools) and address them. Find out what incentives would get them involved (free gardening classes, nice benches to sit on, a share of the harvest) and make sure to include those if you can. Businesses are generally great at this – they call it market research. They know that if they get their consumer wrong, a new product or service might tank and they’ll lose a lot of money. The non-profit sector can be woefully lax about doing the same thing – instead, we often assume that we know what people need without asking them directly. At the Otesha Project UK, this process is called ‘people research’ and there are all sorts of forms it can take. One group we worked with, at Goldsmith’s University, dragged a sofa onto the street and invited people to sit down for a tea and a quick chat. When I worked with Sony’s sustainability champions, they carried out an online survey with 450 employees. Both were really effective. You might start by holding an open meeting or a community event, but remember that not everyone will come to you – you’ll also have to go to them. For example, if your initiative is trying to bring together people from different faith backgrounds, you might want to visit synagogues, mosques, temples and churches. If you’re working with young people, go into classrooms and youth clubs. If you’re running a community project, get up and start knocking on doors. This can be slow going and is tempting to skip, but it’s incredibly important – the design phase is the foundation your project is built upon. 2. Invite people to take on governance roles. If you meet people who are particularly enthusiastic about your idea, who seem to ‘get it’ straight away and who have useful suggestions and insight, then involve them more deeply from the start, and not just as a volunteer. Roles with ownership are ones that involve some degree of decision-making. Helping dig a community garden or serve meals at a soup kitchen are great volunteer roles, but they won’t necessarily involve ownership. Helping to set the vision for a community garden, on the other hand, involves higher-level participation. Inviting people to join your board or an advisory group is a way to give them ownership. So is inviting them to take part in planning meetings or program reviews. 3. Create a safe and welcoming space. No matter who your stakeholders are, they will thrive when in an environment where everyone is respected and all opinion is valid. 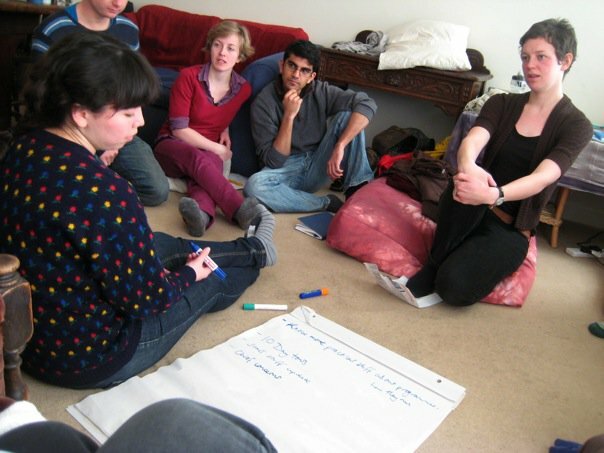 To create a safe space at gatherings or meetings, you might want to think about identifying a host for each gathering, welcoming people as they come in the door, making introductions, choosing an accessible space, facilitating thoughtfully, and setting ground rules for how to deal with power and privilege. The ability to fail combined with protection against failing too big is a powerful element of a safe space. I used to sit on the youth board of the Sierra Youth Coalition, the youth wing of the Sierra Club of Canada. Youth board members had the ability to set the organization’s strategic direction, hire staff, approve budgets and make other high-level decisions but we had a buffer against legal or financial responsibility – the Sierra Club’s board took on overall responsibility for that. This was a great way for us to take the lead in a meaningful way while limiting our liability. 4. Build skills & involve people in the right way. Asking a young person to become your board treasurer is only going to work if that would-be number cruncher has a sufficient level of financial literacy and is interested in learning more. Even then, he or she might be lacking the confidence to call out bad decisions, challenge the organization’s staff, or take a touch stance on an issue. In these situations, mentoring can be great for building confidence and finessing skills. It’s important to make sure everyone involved feels like they can contribute in a meaningful way. Clear roles help, especially those that take advantage of each person’s unique skills. If someone really wants to become a trustee but needs help learning how to chair meetings or take notes, get them support to develop this skill. Or let them co-lead the role with someone else, or rotate is amongst all trustees. In this way, you can create a space where everyone is developing leadership skills. 5. Get feedback. And then implement it. Gather feedback in the format that makes the most sense to the people you work with. At the Otesha Project, feedback on their program for environmental educators is gathered in four distinct ways at different points: anonymous feedback sheets, one-on-one conversations, group ideas sessions to build on each others’ thoughts, and by email after the end of the program. If your stakeholders have varying levels of literacy, written feedback might not be best. If you’re gathering sensitive information, don’t ask them to give it publicly in a group session. If you’re working with young people, you might want to make it as fun as possible. The number one way to lose trust is to ask someone for their feedback & then immediately disregard it. You might not always be able to implement every idea, but it’s important that the person giving their thoughts knows they’ve been heard and taken seriously. If you can’t implement someone’s feedback because of budgetary or other constraints, let them know why. 6. Be transparent. Information-sharing invites more people to get involved, and helps people to stay involved. You could start by sharing stories of what you’ve done over the past year, with an honest assessment about what’s worked and what hasn’t. And it’s crucial to share boring details, like meeting notes, since volunteers who can’t come along to the meeting can quickly get out of the loop if they don’t have an easy way to catch up. Make use of online tools for organizing like Google groups and Doodle so that people are never accidentally left out. Don’t let personal relationships dictate who has access to information. 6. Think about who’s on your staff team. The UK-based mental health charity MIND gives staff priority if they’ve had experience dealing with mental health issues either personally or through a family member. At Otesha, over half of the current staff started out as volunteers. At Bikeworks, several of the homeless people they’ve trained to become bike mechanics are now working in their shop. This doesn’t work in all cases for all organizations, but it’s a really effective way to ensure that your stakeholders will have a say in the direction you’re going. These thoughts are based on my experiences. I’m sure there are many more useful tips out there, and possibly conflicting ideas too. Any thoughts are welcomed! What do values have to do with it? For those of us working to create long-lasting systemic change, questions about means versus ends can generate lively and often heated conversations. If we only have a few years to stop catastrophic climate change, slow environmental degradation and fight poverty then shouldn’t do whatever we can right now to make the biggest impact? If we believe that time is of the essence, shouldn’t we scale ourselves up as quickly as possible even if it means acting like outdated institutions? 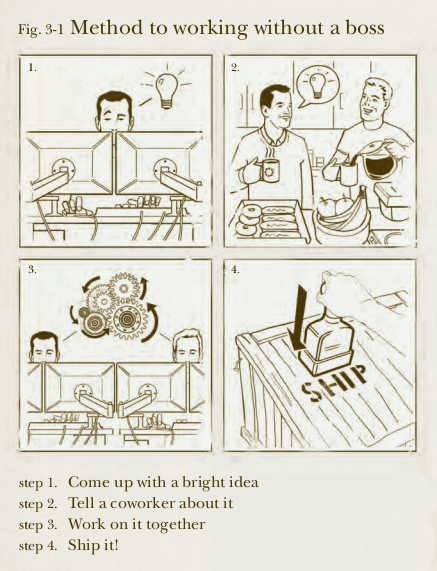 If it helps us be more efficient, should we build rigid top-down decision-making structures? Is it okay to burn out team members during the start-up phase if it’s for the greater good? Should we fly all over the world telling people how to reduce their carbon footprint? Do we take funding from anywhere that offers since it will enable us to do more? Tough questions those, and no easy answer. However, recent work being done into the impact of values-based campaigning sheds some interesting light. If we believe we’re playing the long game (and for what’s it worth, I think that we are) then the means become just as important as the ends. 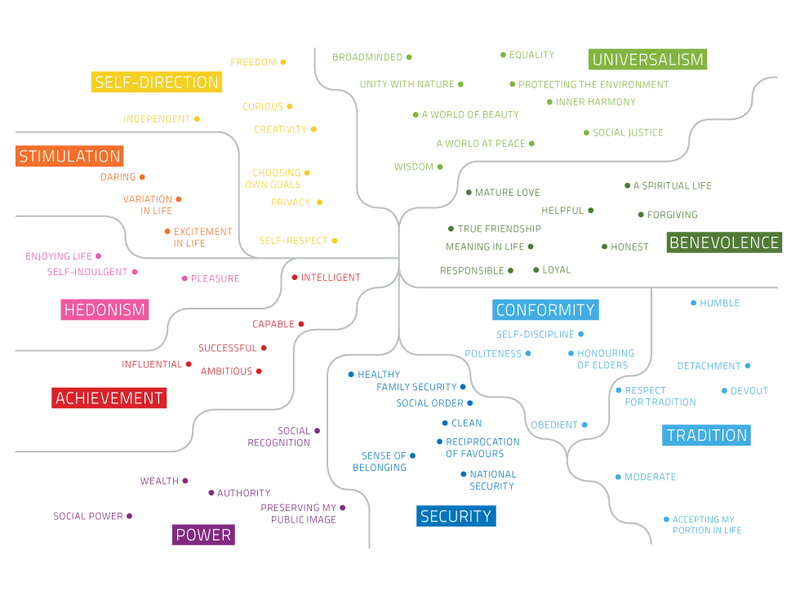 The Common Cause report and resulting project, which was commissioned by a consortium of UK-based organizations, highlights the big reasons why values matter – they shape our attitudes and behaviour, they’re deep-rooted but can be influenced and – most interestingly – some sets of values are in direct conflict with one another. By encouraging one set of values, we could actually be hurting the values that might be behind actions like community involvement, volunteering, democratic engagement and working actively for the social good. This conversation helped give me a language to describe why the different projects I’ve chosen to get involved with have placed huge importance on ‘walking the talk’, or putting values into action. For example, the Otesha Project‘s aim is to help young people take action on social and environmental issues and inspire others to do the same. Over the past five years, our team has had many conversations about the impact of what we eat, wear, get around on, and otherwise consume. How much does living our values matter? For us, the answer was that it matters a lot. When the Otesha team sat down last year and talked through our key values, we identified equality, genuine participation, holistic thinking, social justice, environmental sustainability and freedom from oppression as important values that drive our approach to everything from what new programmes get developed to where we get our funding and how we run team meetings. Our shift to a non-hierarchical structure was also part of aligning ourselves more fully with our values. For us, living and breathing our values was incredibly important. It’s given us much greater credibility with our stakeholders, especially young people, ensured that we always had a dedicated and committed staff team, and inspired a ripple effect of change in other organizations. Why might articulating & acting on your values matter? Credibility: If you are an environmental non-profit based in a green building, a sustainability communications agency that gives employees extra vacation days for low-carbon travel, or a youth organization that’s actually led by young people, you will come across as more authentic and genuinely committed to your goals. And most importantly, you’ll actually be more authentic and genuinely committed to your goals. Staff commitment & retention: If you lay your values out clearly, you will attract people who share your values. If you live your values internally as well as promote them externally, I’d wager that you’ll create a pretty great place to work – an inspiring, game-changing place even. At Otesha, we found incredible team members who were specifically attracted to our cooperative decision-making and who looked forward to the job as a chance to make some lifestyle changes they always intended to do but needed some support with (like cycling in London – eep!). Better strategic decisions: Shared values are a great way to assess whether a particular partnership, collaboration or funding relationship will be a good fit. New initiatives can also be sussed out this way, weeding out ideas that don’t align completely with your values. I’ve learned the hard way that some potential partners might look great on paper, but turn out as a disaster in real life because of a values mismatch. 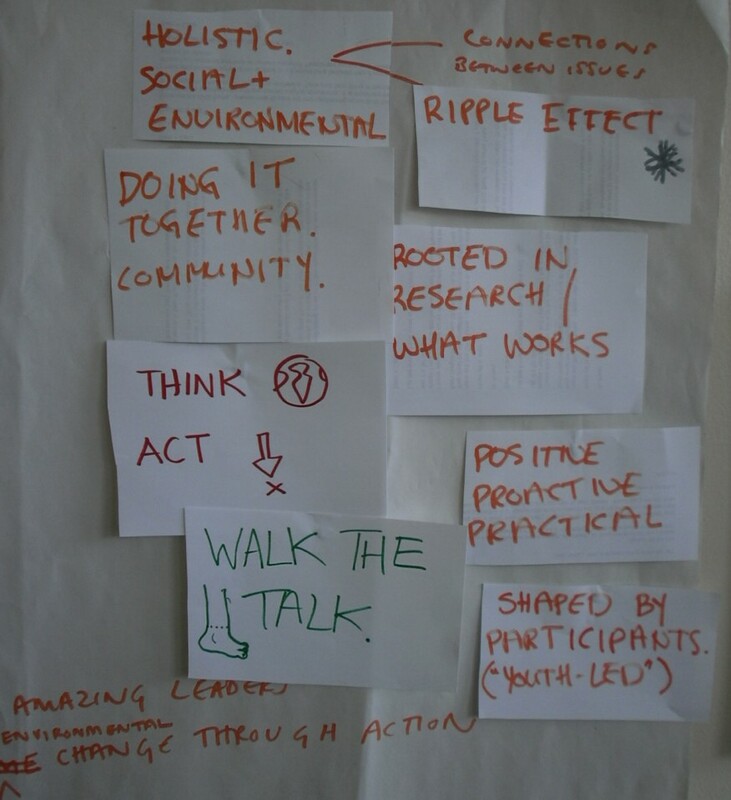 And now I know that I work best with people who believe that social and environmental issues are deeply interconnected, genuinely value and want to encourage deep participation, and get excited about creativity and innovation. Broaden your impact: By working in a way that’s aligned with your values, you might inspire other organizations to do the same. Otesha’s had loads of interest in our Corporate Screening Policy that determines what businesses we will and won’t take money from. Several organizations have said they’re looking at implementing a non-hierarchical working structure based on our success. And people are consistently asking us about the most low-impact ways to refurbish their offices or plan their next holiday.